od 3 do 20 godz. 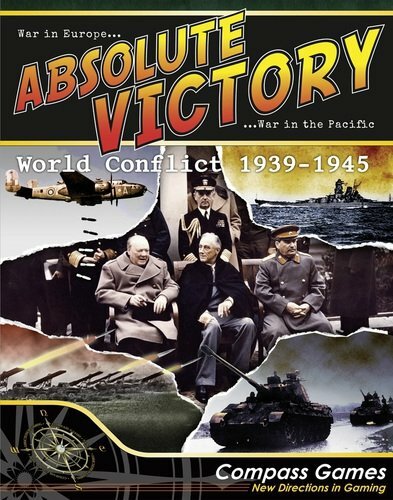 ABSOLUTE VICTORY: World Conflict 1939-1945 (“AV”) is Compass Games’ global level ‘mini-monster’ simulation of the Second World War in every theater, real or potential. Unlike many bigger games, AV concentrates on the fun stuff – ground and naval combat – while simplifying the boring stuff like unit production and logistics. Ground units are 30,000 to 100,000 man armies, while naval units are individual battleships and carriers plus their escorts. Each air unit stands for some 250-800 aircraft, all handled in an off-map display that minimizes clutter. 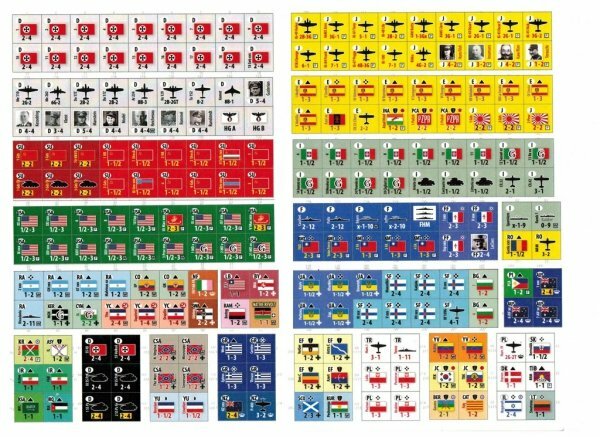 The game’s mode-based land combat system, designed by Wes Erni, models real decisions and objectives of strategic commanders in terms of time (how long it takes to take the objective, or how long you can delay the other side’s forces), casualties (how much damage was taken by each side in the battle), and position (whether the defenders held or were forced to retreat). 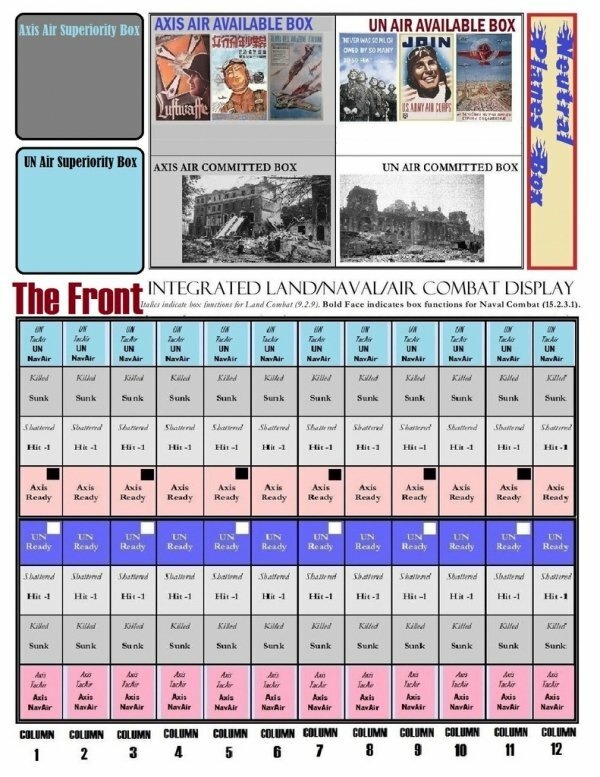 This is no rock-scissors-paper guessing game; you choose specific modes based on your real battlefield objectives! Do you want to take territory or do you want to grind the life out of enemy armies? Do you really want to fight the enemy or just slow him down? Are you using infiltration tactics or “charging up the middle”? All these decisions and more are yours to make, in the context of a chess-like system of alternating pulses that means very little down-time for the non-phasing player. The result is an incredibly tense experience where your grand plans often founder because your enemy is always moving to respond. More than 2,500 random events introduce economic, diplomatic, and political developments in ways that demand a player’s attention without overshadowing the “panzer-pushing”. Production rules are simple but realistic and do not involve any ‘production point’ bean-counting. 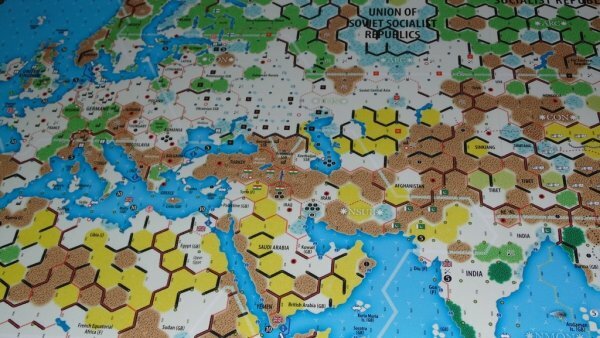 Optional rules allow for oil and resource requirements, code breaking, industrial retooling, variations in rail gauge, the tactical brilliance of generals, and added military detail. The impressive global map allows one seamless worldwide battlefield but gives more detail to areas (such as Europe and East Asia) where the war actually took place, and less (Siberia, the Americas, sub-Saharan Africa) where it only could have. 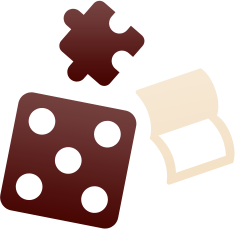 The game thus allows a single set of rules to be used for every theater and avoids the disjointed split-scale treatment found in other global-level treatments. 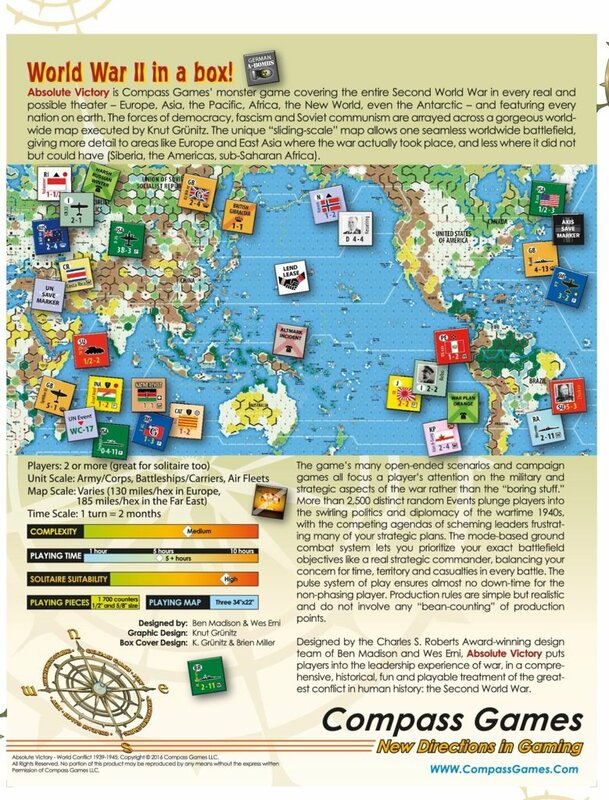 The result is a highly re-playable, realistic game that thrusts the players into the tense and unpredictable world of the 1940s by focusing their energy and attention on the military and strategic aspects of the war, all in the context of the larger-than-life leaders and great ideological crusades that gave World War II its historic significance.